This solid wood jewelry box combines Shaker style with organization. 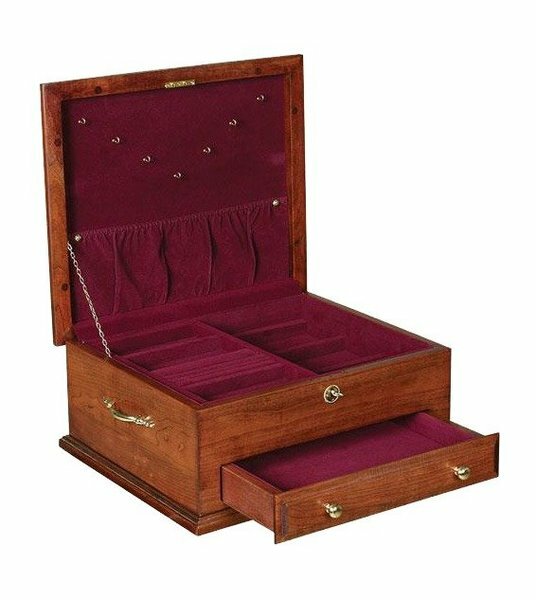 Our classic Shaker Jewelry Box is made in America with Old World Craftsmanship from solid oak or cherry wood. Includes brass hardware, lock, lift-out ring tray, necklace hooks and pouch. Your choice of hunter green or burgundy felt lining. Available with or without the rose design on lid. All of our Amish furniture is made in the USA of 100% solid hard wood! We offer Jewelry Boxes, Jewelry Chests and Jewelry Armoires! Jewelry Boxes, Jewelry Chests and Jewelry Armoires are a great gift idea! Thank you all so very much for your attention and customer service. It is greatly appreciated! I love my jewelry box, it’s absolutely perfect! We indeed received the replacement jewelry box and if possible, the work is even better than original. Our thanks to you and to the craftsmen in your company that offers such beautiful work. My wife is completely happy with the final product and it did arrive a bit before we expected it.